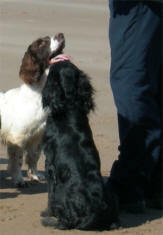 Gundog breeds are taken for one-to-one Training. Over the years our training and facilities have evolved to enable us to generate what should be your shooting companion. No matter if it is a Spaniel flushing in the beating line or to be shot over, or Peg Dog.. All our training is based on steadiness and reliability. Firstly it is needed to gain both the trust and respect of your dog which in turn helps us guide your dog to voice, hand and whistle commands … through trust & respect, not fear. 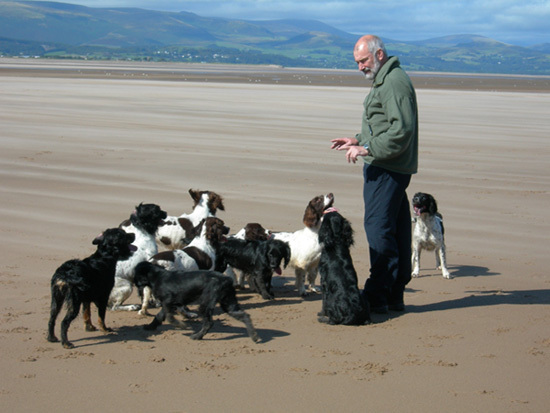 All training depend on the age, ability, and experience of your dog - we no longer offer Residential Training, but can undertake to train you, the owner, on one-to-one basis, all clients and pupils are assessed as to their suitability to be trained for the tasks expected of them. In certain cases this can include time in our two acre Rabbit Pen usually stocked with both rabbits and pheasants - for training steadiness and desensitisation of any chasing behaviour. A rabbit pen is an important part of a dogs training program; from puppy training, novice training, and refresher training. It is the best way to produce controlled multiple contact flushes in order to steady a dog. Our Rabbit Pen (currently under repair and re-stocking) is usually well maintained and stocked all year round with rabbits and game birds to give the real feeling of the wild, it covers nearly two acres and consists of mostly natural cover such as bracken, bramble, woodland, brashings, etc – all well enclosed in order to create an ideal training environment for all gundogs. A Rabbit Pen is a great asset to training, as it the best way to produce multiple contact flushes within a predictable, but natural environment, allowing the handler to introduce a young dog to hunt, find and flush game within a controlled environment. 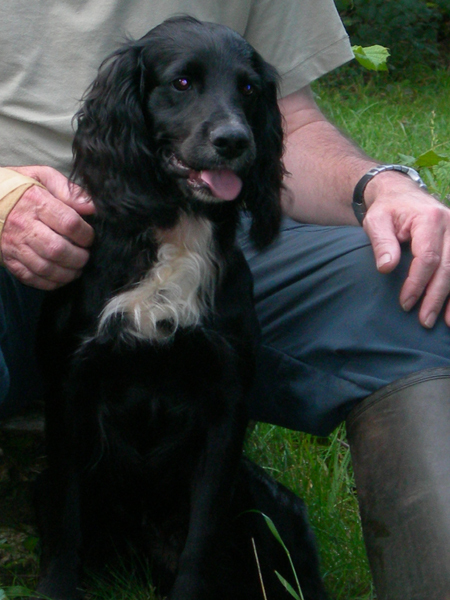 It can also be used correct faults such as chasing, running in, and other general bad habits – it really is an extra special aid for gundog trainers. If used correctly, it can help develop steadiness to fur to its highest degree in a relatively short time. 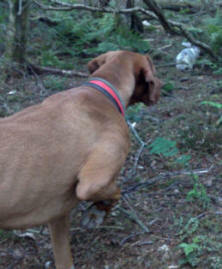 Novice Training: Encouragement and instruction on how to find hidden game while exhibiting steadiness to live game. Also, simple sit to flush, gun sense and retrieving amongst live game. For all breeds, only once they have been soundly taught basic obedience such as the sit & stay, and 'stop' the pen is perfect for added distractions such as thrown dummies; there is no reason why further or advanced obedience lessons should not be undertaken in the pen where the distraction of rabbits running past the stationary dog can be introduced. Heelwork can also be practiced, making sure each time a rabbit runs by the dog remains steady, or better still sits down immediately. The rabbit pen is an important part of a dogs advanced training program, and then as a refresher or maintenance training. Used during the summer months it is good way to keep a dog’s training up to scratch and ready for the coming season. A controlled environment such a Rabbit Pen is a great asset to training as it allows the Gundog handler to introduce a young dog to hunt, find and flush game within. It can also be used correct faults in working Gundogs such as chasing game, running in, etc, but also unwanted behaviour in pet dogs; such as chasing, and other general bad habits. The Rabbit Pen is used throughout the year but when used during the summer months it is good way to keep a working dog on form and ready for the coming season. The rabbit pen is not available for general hire but can be made available for our existing students and training is offered to gundogs and handlers that are novice/advanced providing the dog has achieved a good level of control.